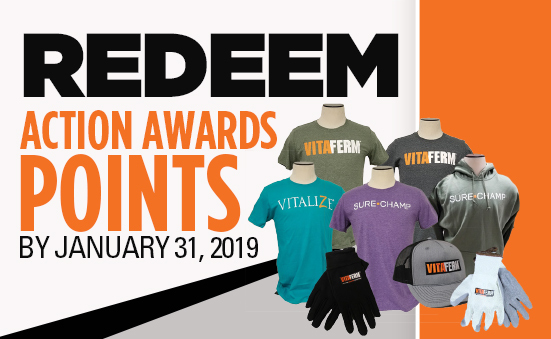 Don’t miss your chance to redeem your 2018 Action Awards points! All points MUST be redeemed by January 31, 2019. If you have any questions, contact Jennifer Miller at jenmiller@biozymeinc.com. 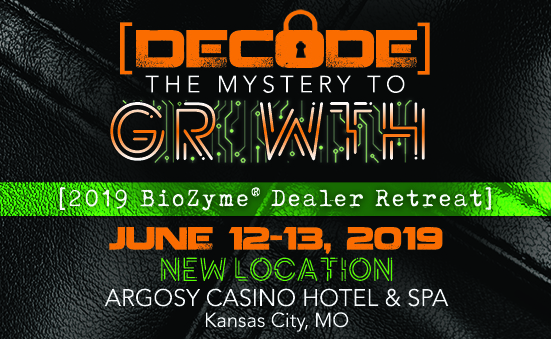 We are excited to announce a NEW LOCATION for the 2019 BioZyme Dealer Retreat. Make plans to join us June 12-13, 2019 in Kansas City at the Argosy Casino Hotel & Spa. All dealers who sold 50 tons or more in 2018 are invited. Invitations will mail out in early March. If this is your first year to attend Dealer Retreat, there will still be an opportunity to come tour BioZyme headquarters. BioZyme® dealers Tod and Sondra Brancel, Next Generation Genetics at Endeavor, Wis., wear many hats. 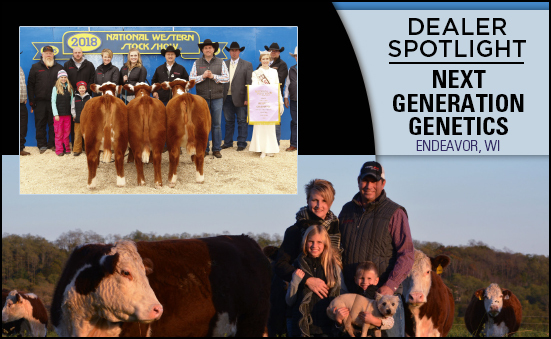 They work together to manage and operate a registered cow herd, both work off-farm jobs and are raising two children involved in activities. Despite their busy schedule, they have experienced significant growth in their BioZyme business and their action rewards points in their second year as dealers. Sondra says their success stems from following the golden rule. 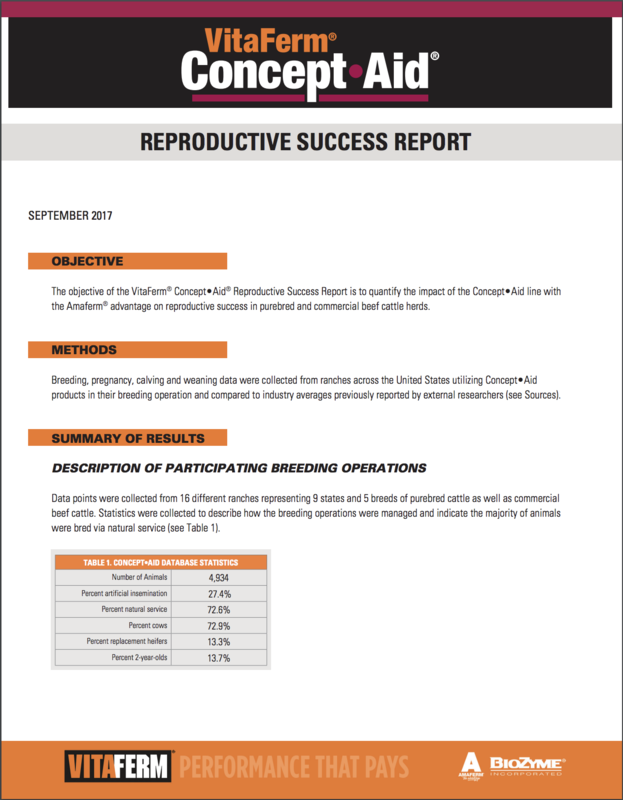 The Brancels first started using VitaFerm® products after conducting their own research and trying the products on their cows that were experiencing lowered conception rates, likely due to high iron in the water source. Once they started using Concept•Aid® and saw the results, they became dealers. Word of mouth and their peers knowing they use the product have been good marketing tools. Sondra also emphasizes that keeping a small, realistic inventory is key to keeping happy customers, while making economic sense to her and Tod. They don’t keep an extensive inventory but do know what their customers need and try to have it because she knows not everyone plans ahead. “We are willing to have products a customer uses on hand, even if we don’t use them ourselves. I try to circle back with regular customers to make sure their needs haven’t changed before I place an order,” she said. Involvement with industry organizations and communication with BioZyme staff are also important steps that Tod and Sondra take. Sondra has helped ASM Kevin Arand staff the booth at the Wisconsin Cattlemen’s Meeting. 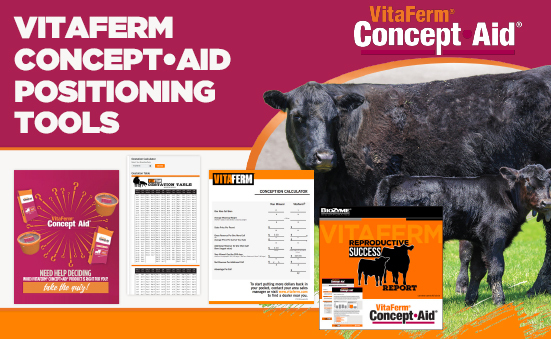 Tod and Sondra are also active in the Wisconsin Hereford Association and have hosted a tour stop at their farm, allowing other cattle producers to learn more about the VitaFerm products. 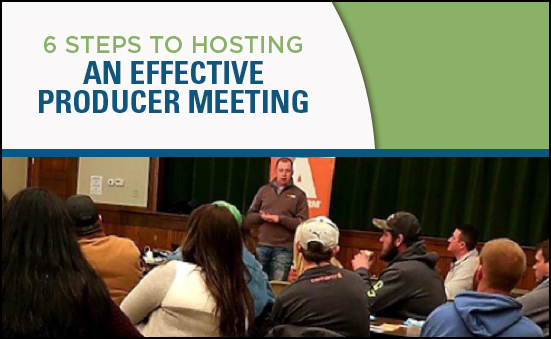 “The Wisconsin Cattlemen’s is a small enough trade show space that we get noticed, have an attractive booth, and other producers like to see me there as a producer who actually uses the products and carries the product. We don’t run down a competitor, but rather show them the data and research behind the products. The product they are using might be just fine for them, but our product might go above and beyond for them if they give it some time. You can’t buy six bags of mineral and expect to see a change overnight,” she said about working the trade show. In addition to industry involvement and peer interaction, Tod takes his training as a veterinarian and embryologist to help others understand how good nutrition ties back to reproductive health. He is able to create partnerships based on his practical knowledge of using the products and his academic training to explain how and why the products work. He also works closely with Kevin to help customers test feed samples to make sure the customers are getting the right supplements for their animals. 1. Set goals on what you want to achieve. 2. Be honest and fair with people. 3. Know your product and know why someone would use it. 4. Be knowledgeable; use the tools BioZyme provides so people will turn to you as a trusted source. “If you are confident in the advice you’ve given your customers, use the sales tools and product information that you’re provided as dealers, and treat others the way you want to be treated, you should experience growth,” Sondra said. I realize there are lots of potential goals in business but I, wrong or right, always assume businesses want to grow. With that in mind, growth always starts with the belief that it’s possible. 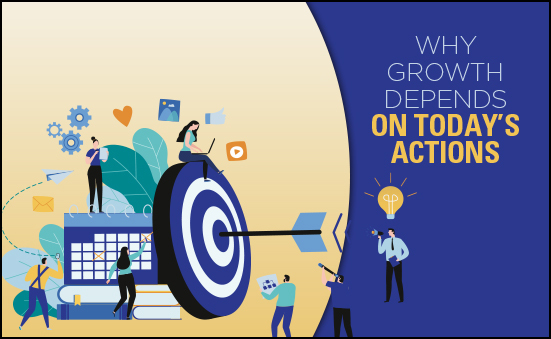 Once you have belief in the growth potential of the business, action must come next. This includes action from you and all those on your team. Your action is the key to focusing on the right information in the right order—much like the combination to a safe. You cannot attract abundance without taking action. 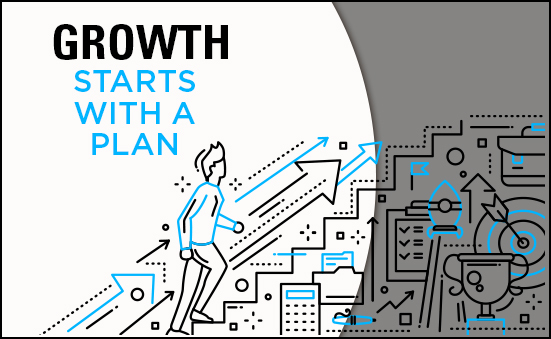 Unless you are doing at least one material thing each day to move your business forward, you are never going to grow your business as quickly as you could. I’ve always been a firm believer that one of the simplest and most important secrets to success in any discipline is ACTION, just the simple act of doing. Leadership is essentially nothing more than swift and responsible decision-making that in turn creates consistent action. The research shows that often the most successful people are those that simply tried many different approaches until they found one that worked. Material action is something that has meaningful revenue or profit implications from its output. On the revenue side, it could be things like launching a new marketing campaign or making a new sales call, ideating a new product line, expanding to a new target-customer or geographic market, hiring a new salesperson, holding a producer meeting, etc. Anything that will drive new revenues. On the profit side, it could be things like cutting your cost structure or improving your business efficiency. Or, it could be improving your company morale and productivity or similar tasks. Anything that will drive higher margins for your business. On the flip side, there are a lot of demands on our time that are important but are not material action. These are things like posting to social media accounts or writing a new monthly email newsletter. Or, it could be managing the ad agency, doing one-on-one meetings with direct reports, running payroll checks, upgrading systems, relocating the office, etc. Yes, these are important tasks that need to get done. But none are going to propel your business to the next level. What to do to achieve material action? Where are you spending the vast majority of your time? 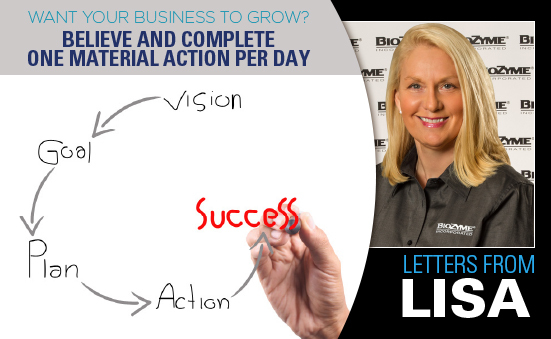 If you are not spending at least 20% of each day on “material actions” you will not have a reasonable chance to grow your revenues and propel your business to the next level. I encourage you to keep a TO DO list that is divided into what I like to call normalcy versus material action. In my opinion it is very easy to stay stuck in normalcy all day, every day. This list approach helps to remind us of the material action we need to take and jolts us into realizing that we aren’t on the right track when we review it EACH WEEK. So, what else can you do today to take some action? 1. Choose something today and take action immediately! 3. Don’t worry if your idea is not 100% perfect – it never will be. 4. Remember to be open to different outcomes and to relax and enjoy the productivity of ‘DOING SOMETHING’! I guarantee you that by taking action and DOING SOMETHING (no matter how small) you will come out feeling positive, enthused and energized – so do it now! 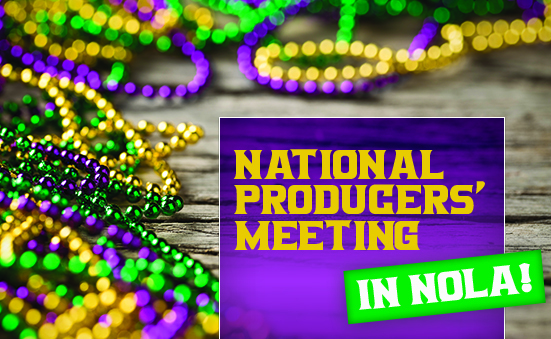 On January 30th, the first evening of the 2019 Cattle Industry Convention & NCBA Trade Show, BioZyme® will host an off-site Producers’ Meeting at the Pat O’Briens Briar Suite on Bourbon Street. Come from 7-10 PM to learn about the value of quality nutrition from Alan Lee, Director of Domestic Business Development for BioZyme Inc., and get your questions addressed by a live producer panel! Transportation to and from the convention center will be provided. RSVP by invite ONLY. If you are attending the NCBA convention or have customers or potential customers attending that you would like to receive an invite to this private event, please send those names and email address to Jessie Judge at jjudge@biozymeinc.com by January 9.